Video clip synopsis – Australia needs new migrants to populate the country and build a more prosperous nation. English lessons are available everywhere, including through correspondence and radio courses. Broadband MP4 migrantslearn_bb.mp4 (6.6MB), suitable for iPods and computer downloads. 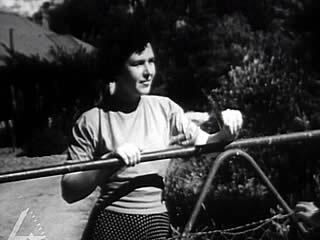 A Land of Milk and Honey and English Lessons is an excerpt from the film Migrants Learn to Be Australian Citizens (3 mins), a segment from the series Australian Diary , produced in 1951. Migrants Learn to Be Australian Citizens: A short film designed to tell Australians how new migrants are adapting to life in Australia, with a particular emphasis on English language education and the importance of migrant labour to the ongoing development of the nation. Australian Diary: Filmed between 1947 and 1970, the Australian Diary series records how Australians have lived, worked and played over the years. Each of these short black-and-white films provides a snapshot of Australian life at the time, from rural areas and small towns to capital cities. Informative, entertaining and often amusing, the subjects range from serious to quirky and cover everything from innovations in agriculture, industry and science to sport, art, education, fashion, flora and fauna. There are a total of 136 diaries with 440 individual stories, providing a picture of a proud, diverse, idiosyncratic and constantly changing nation. Australian Diary is a National Film Board Production. Produced by the Department of the Interior. H.2 A student describes and explains different relationships among texts. After World War 2 the Australian Government brought a number of Europeans displaced by the war, knowns as DPs (Displaced Persons) to Australia. This was followed by a massive migration scheme which brought more southern, eastern and western Europeans to Australia. Most of the European migrants could not speak English. This influx of migrants was almost a social revolution in Australia, as most previous mass migration had been focused on British people. This migration would have a major impact on the migrants’ lives, but also on Australia. Australian cultural life changed dramatically over time. These 'new Australians’ rose to the challenge of starting life again in a new land. They raised their families here. Their children are first generation Australian Europeans with mixed cultural values. Define the terms, ‘migrant’ , ‘immigrant’, ‘assimilation’, ‘integration’ and ‘multiculturalism’. Why would learning the English language be so important to a migrant? Who (that is what audience) do you think should be shown the video clip? Give two reasons why. Why do you think the filmmaker would need to make a film about migrants learning English in the 1950s? Write a 50-word summary of the video clip that includes what the video clip is trying to persuade the audience to do. ‘After World War 2 the Australian Government introduced a massive immigration scheme involving British and, as a new major source of immigrants, displaced European war refugees. Most of the European migrants could not speak English’. List the benefits for migrants shown in this video clip. Identify and list the problems for migrants shown in this video clip. Write a brief explanation of what you think the title of the video clip means. Suggest another title for the video clip. Imagine that you have migrated to a new country and you cannot speak the new language. Describe the sort of problems might you face. For example, what happens at school? In a shop? With television? On the train? Describe the differences, what you miss and what’s better in your new country. Write a 300-word letter home, using all the information from your answers to 3a) and b) in which you talk about a day in your life in the new country.